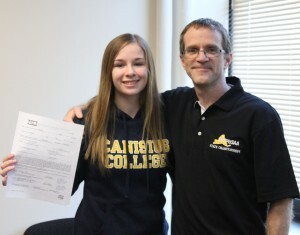 Hard work, training and dedication have helped propel John C. Birdlebough High School senior Haylie Virginia to the next level, as she recently signed her letter of intent to attend Canisius College in the fall. Cross-country standout Haylie Virginia and coach Andy Lewis are all smiles as Virginia signs her letter of intent to attend Canisius College. The standout runner, who specializes in the pentathlon, noted that she has put in countless hours of training and overcome several injuries to get to where she is today. That hard work paid off with an all-state selection, a third-place finish at the state meet, and the respect of her coach and peers, who selected her as team captain for the cross-country and track and field teams. In addition to her athletic accomplishments, Virginia has also excelled in the classroom where she is consistently on the honor roll. She maintains a 92 percent average while balancing sports, DECA and a part-time job at the YMCA. With a broad range of interests, Virginia said she is considering taking business courses, although she is undecided if she will major in business or another subject that piques her interest. Virginia is the daughter of Matt and Michelle Virginia.